There were 714 press releases posted in the last 24 hours and 153,521 in the last 365 days. 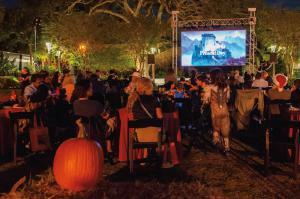 CLEARWATER, FLORIDA, USA, November 1, 2018 /EINPresswire.com/ -- On October 31, the Church of Scientology Flag Service Organization hosted a Halloween Movie Night for the community where youth were able to trick-or-treat in a safe, family-friendly environment. The event was held at the Osceola Courtyard on the corner of Fort Harrison Ave. and Drew Street. The evening featured a screening of Hotel Transylvania 3 and was free to the public. More than 400 children and parents attended.